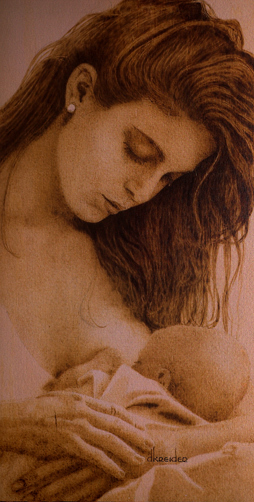 One of my more involved works in woodburning and stain this piece features women across the lines of politics and ethnicity bound together as a diverse human family. 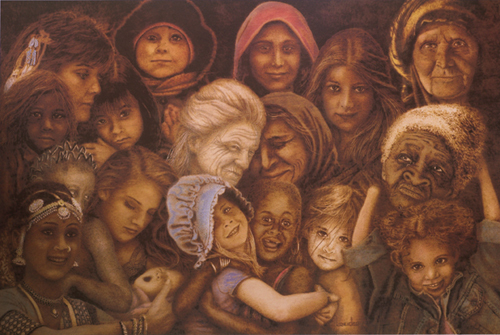 Represented are a Native American, African-American, Ukranian, Palestinian, Afghani, Jordanian, Greek, Israeli, Nepali, Vietnamese, Czechoslovakian, Indian, Rwandan, Bolivian, and Irish. 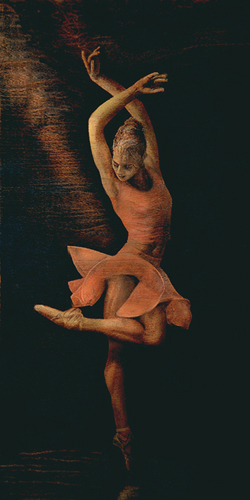 A dancer moves to her own music in the light of the moon. 12x20 single-matted in black core dark ash with a closed "v' groove trim line, framed in dark ebony-stained oak and under glass, a 1st Generation original giclee from an intermediate pyrogravure coloree on birch. 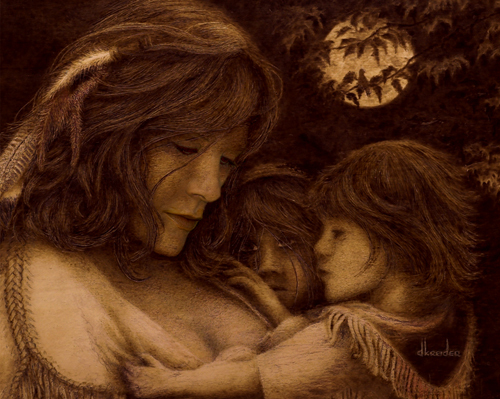 A rendering of a native mother with her children nursing her youngest in the moonlight and to the sounds of the night. Her quiet strength, spirit, and warm heart are written in her beauty and in the devotion of her daughters and young son at her breast. Available 16x20, this piece is matted in double cut dark olive or chestnut and gold, framed in oak and under glass, an original multiple media print derived from a woodburning on poplar, signed and numbered by the artist. A young Cherokee woman remembers the journey.. away from their home in the beautiful Blue Mountains, a trail of tears. 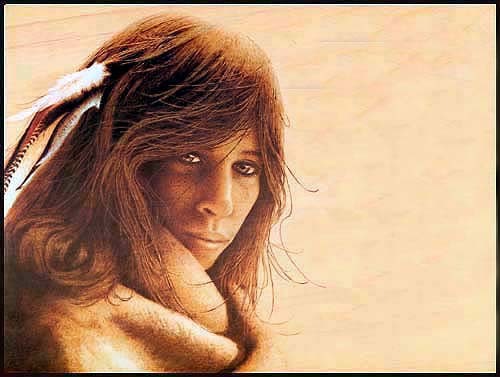 She wears the eagle feathers of her people, and in her eyes and the lines of her face is written the beautiful spirit and the love and loss of what was hers and her peoples'. 16x20 gold-trimmed chestnut/gold mat, framed in oak and under glass, a limited edition reproduction from a woodburning on poplar, signed and numbered by the artist. 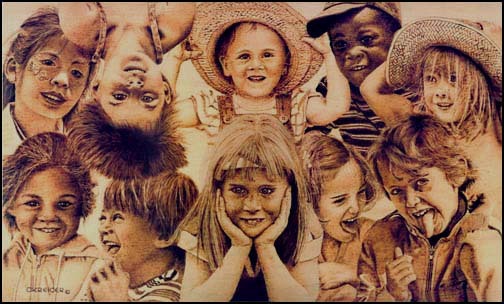 This playful piece captures the spirit and spontaneity of children. Represented are four sisters, a Greek-Cypriot boy, an African-American baseball fan, an Oriental face-paintee, a boy who lives with Down's syndrome, a foster child of mixed race, and the artist's daughter. Available 18x26 matted in double-cut dark olive and gold framed in oak and under glass, a limited edition reproduction from a woodburning on poplar, signed and numbered by the artist. The love of a mother for her baby. 12x20 gold-trimmed chestnut mat, framed in oak and under glass, a limited edition reproduction from a woodburning on poplar. A descendant of the Iroquois, a proud people native to the Virginias, Tawny draws her quiet strength from nature. 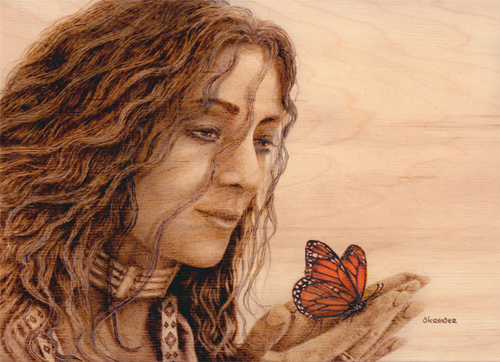 According to legend among the Papago of the American Southwest, the butterfly, created to bring beauty to the world, holds a special place in the heart of the Great Spirit.. If you whisper a wish to her, the legend goes, the Great Spirit will receive it with kindness from this emissary and in time grant your desire. Available 16x20, this piece is matted in double cut dark olive and gold, framed in oak and under glass, a limited edition fine art reproduction from an original pyrogravure colorée on maple.